Now accepting online applications. Below are links to online and supplemental forms. Printed applications may be requested from the Admissions Office at 336-564-1011. To see more of our beautiful campus, visit our online Virtual Tour. Application online and a non-refundable fee of $110 must be submitted. A transcript request form and discipline form signed and delivered to your current school. The Parish Participation Voucher is required of Roman Catholic applicants desiring the Catholic tuition rate. Complete the form and submit to your parish office. Applicants and their parents will have the opportunity to tour the school, attend a class and interview with a member of the admission staff. Please call Admissions, 564-1011, for an appointment. Admission letters are mailed out in mid-March. Please click the "Log in to start"
If you have yet to start an application, create a user account by clicking "New User Registration". Select your relationship to the applicant and begin the application. Always SAVE form and continue(bottom right) to move through the application. Complete the on-line application and submit application along with online credit card payment ($110 fee non-refundable). Print and submit the Transcript request form and Discipline form to your current school. The Parish Participation Voucher is required of Roman Catholic applicants desiring the Catholic tuition rate. Complete the form and submit to your parish office who will mail it to Bishop McGuinness. The forms can be downloaded on the last page of the application or at the application procedure page of bmhs.us. After you complete the application, you may print a copy for you records. Please allow 3-4 business day for processing of your application. The Admissions Committee will consider applications at the conclusion of the first semester once all information listed above has been received. Consideration for admission is based upon standardized test scores, placement test, grades and disciplinary profile. With notification of acceptance a non-refundable $150 registration fee is due. Until this fee is received a student is not officially entered on the roster for the school year. You will also receive information on the registration date(s) for selecting classes, and bus registration. A current Tuition and Fee Schedule and Payment Method Plan and bus transport program information is used only as a reference. 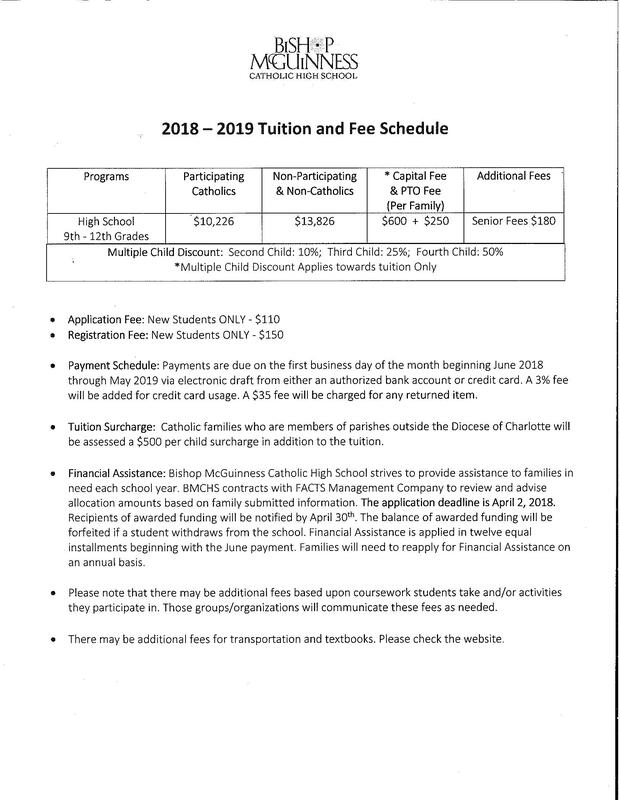 You will be notified of the rates for the next school year once adopted by the Board and Diocese of Charlotte in early February.